“Gutter Clog” by Eric Schmuttenmaer. Used with Permission. This April, like many Aprils, rain storms happen frequently. So don’t let leaves clog your gutters and damage your home. Cleaning your gutters properly can help prevent any issues this spring and the rest of the year. Stagnant water is the perfect place for plant growth, the most common of which in gutters is mold. Mold spores can spread through open doors, windows, and vents, putting the health of others and yourself at risk. Health issues from mold include breathing problems, fever, headaches, itching or watery eyes, among other issues. If plants are growing in your gutters, they also disrupt the proper flow of water. Because of this, it’s possible for water to back up into the eves and over the side of your house, where it can cause internal and external structural damage. Water damage can be minor if the issue is caught soon after it occurs. However, if it isn’t stopped, it can easily end up costing several hundreds or thousands of dollars. The integrity of your house relies largely on the foundation, and an overflowing gutter can compromise it. Water that collects around the foundation will eventually break down the materials that hold the foundation together, leading to cracks and weakening the foundation. Not to mention, it also discolors the foundation, making it aesthetically unpleasing. Watching out for slow moving or stagnant water. If this occurs, check for a clog in the downspout. 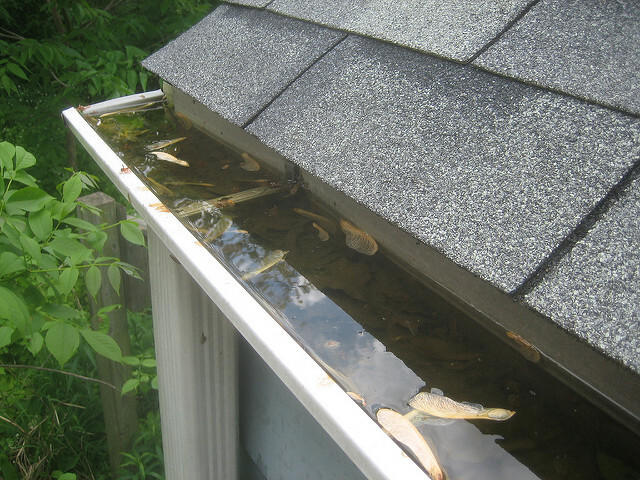 Even well-maintained gutters sometimes get a clog (especially during autumn). Installing gutter guards to screen out leaves. If you do this, you won’t even have to watch out for clogged downspouts. Install a downspout for every 40 feet of gutter to avoid overflows during rainstorms. Repair sagging gutters. Sagging gutters can impede the flow of water and indicate the nails/screws/brackets holding the gutters are damaged. Consider installing downspout extensions to keep the water far enough away from the house and foundation. Cleaning gutters may be your least favorite chore, but it is nonetheless important. So, grab a sturdy ladder, put on your gloves, and clean out your gutters. Honestly, they probably need it.